Oil on canvas, 32 x 46,5 cm. Rørbye probably painted this sketch in front of the subject, which was favoured among the Nordic painters travelling in Italy at the time. 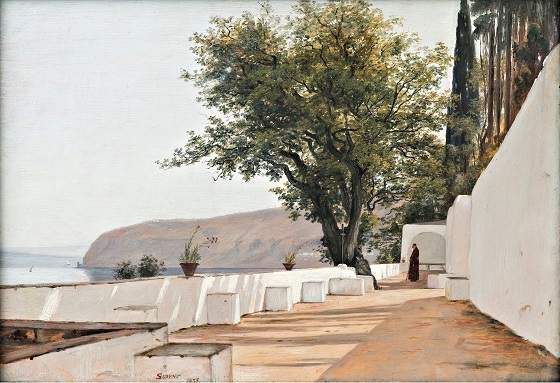 The wide, white terrace with a view across the Sorrento Bay was part of a monastery complex for monks of the Capuchin order. One of them can be seen at the back of the picture in the characteristic, brown robes with a rope around his waist. Taken as a whole, the subject is classical in style, but it also contains graphic and abstract painterly qualities such as the depiction of the tall, white wall and the dark, organic tracing of the trees against the white, homogenous sky. Rørbye was clearly interested in the fall of light through the treetops as well as the heavy shadows cast on the ground and the low wall towards the ocean.